On The Hook Charters of Daytona Beach, Florida offers private inshore and offshore guided fishing charters in the Daytona Beach area including New Smyrna Beach, Ponce Inlet and Port Orange, Florida. US Coast Guard and Florida State licensed recreational fishing guide. On The Hook Charters offers charters 365 days a year in the Daytona Beach area. 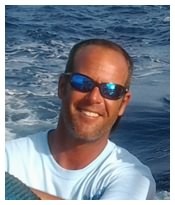 Captain Corey is a FULL TIME, YEAR ROUND Fishing Charter Boat Captain. CAPACITY: 6 Passengers, however we have additional boats and captains available for large groups if needed. Includes everything you need to fish! Fishing Licenses, Rods and Tackle, Bait and Ice for your catch in our ice chests. All you need to bring is your snacks and beverages and of course your hats, sunglasses and sun block. We also Clean and Bag Your Catch! If you had a good fishing trip, a gratuity of 15 - 20% is customary. A 24 hour notice is required to cancel a fishing charter. There is a $300 non-refundable deposit for a ‘no show’. The captain may cancel any fishing trip prior to departure due to weather or other unforeseen circumstance. Deep V Hull, Center Console with T-Top, GPS, VHF Radio and FishFinder. The boat is powered by a 200 HP Suzuki outboard engine. This fishing boat is perfect for Nearshore Fishing, Offshore Fishing and Deep Sea Fishing up to 20 miles off the coast. Our Offshore Fishing Charters include offshore fishing in the beautiful Atlantic Ocean. We can Bottom Fish for bottom hugging species such as Snapper and Grouper. We can go Trolling for pelagic species such as Mahi-Mahi and Sailfish. We also fish Nearshore if you wish to target certain nearshore species such as Sharks or Pompano. Many other species can be caught on our offshore fishing charters including Cobia, Amberjacks, Wahoo, Barracuda and Tuna. Ask Captain Corey what's biting! We have several convenient departure locations near Daytona Beach including New Smyrna Beach, Ponce Inlet, Port Orange or your nearest Daytona Beach area boat ramp. For offshore charters, we recommend our Ponce Inlet or New Smyrna Beach locations that are just minutes from the open waters of the Atlantic Ocean. Captain Corey is flexible and understands that it's YOUR vacation! However, if we are leaving on an offshore fishing charter, it is best to leave as early as conveniently possible for you! Please no night fishing trips! Want a longer fishing trip? If you would like a longer offshore fishing trip, such as a 6 hour charter or 8 hour charter, just let Captain Corey know how long you want to go, how many passengers and what kind of fishing you want to do. Captain Corey will gladly give you a price on a custom fishing charter for you and your fishing party! This fishing boat is perfect for Inshore Fishing along the Halifax River, the Intracoastal Waterway and Ponce Inlet. Our Inshore Fishing Charters include inshore and backwater fishing in the Halifax River, the Intracoastal Waterway and Ponce Inlet. We can also fish the Spruce Creek and Tomoka River estuaries. Spruce Creek and the Tomoka River flow into the Halifax River. The Halifax River flows into the Atlantic Ocean at Ponce Inlet. The most popular species we target on our inshore fishing charters are Redfish, Spotted Sea Trout (Speckled Trout) and Flounder (year round) and Snook and Tarpon (seasonal). Many other species can be caught on our inshore fishing charters including Mangrove Snapper, Spanish Mackerel, Barracuda, Sharks, Black Drum, Jack Crevalles and Gag Groupers. Ask Captain Corey what's biting! We have several convenient departure locations for inshore fishing charters near Daytona Beach including New Smyrna Beach, Ponce Inlet, Port Orange or your nearest Daytona Beach area boat ramp. Captain Corey is flexible and understands that it's YOUR vacation! It is easier to leave later on an inshore fishing trip than an offshore fishing trip so he will work with you to depart at a time that is convenient for you. Please keep in mind that it is easier for Captain Corey to be flexible during the slow season such as September or October than during the busy season such as during the summer months. Please no night fishing trips! If you would like a longer inshore fishing trip, such as a 6 hour charter or 8 hour charter, just let Captain Corey know how long you want to go, how many passengers and what kind of fishing you want to do. Captain Corey will gladly give you a price on a custom fishing charter for you and your fishing party! Includes everything you need to catch sharks! If you had a Good Shark Fishing Trip, a gratuity of 15 - 20% is customary. This fishing boat is perfect for Shark Fishing Trips along the coast. We can also easily fish the reefs for sharks further offshore. Our Shark Fishing Trips are nearshore in the Atlantic Ocean. Sharks in the Daytona Beach area are most plentiful nearshore! The shark species we target are typically found within 3 miles of shore, often just beyond the beautiful beaches where you were sun tanning the day before! We catch a wide variety of sharks including Bull Sharks, Black Tip Sharks, Lemon Sharks, Atlantic Sharpnose Sharks, Hammerheads and Shovel Head Sharks. Since we are fishing for sharks in the Atlantic Ocean, we like to depart as close to access to the ocean as possible. We recommend our Ponce Inlet or New Smyrna Beach departure locations that are just minutes from the Atlantic Ocean. Captain Corey is flexible and understands that it's YOUR vacation! He will work with you to schedule your shark fishing trip at a time convenient for you. Please no night shark fishing trips!